The whole reason you’re writing sales copy in the first place is to get the sale. Am I right, or am I right? Your offer is going to be what entices your customer to take action RIGHT NOW. It’s what your prospect will use to justify their decision to purchase or not to purchase. And the strength of your copy, much like your headline, will determine how successful you are with this effort. There are three parts of an offer – and we’re going to take a deeper look into each of them today. But before we do that, I want you to really be ready to develop this information for each and every marketing piece you put out there. No matter what you’re selling, you should be able to easily say what each of the following three things are without hesitation. Okay? Here’s my biggest tip on creating great offers: don’t wimp out. Don’t offer a measly little discount. You’ve got to get your prospect to stop what they’re doing, go get their wallet, enter in their credit card number, trust you with that credit card number, and eagerly anticipate receiving your stuff. That’s not a small task. Your offer has to rise to that challenge. 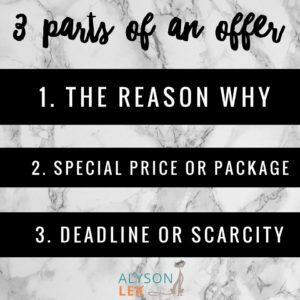 But if you can slow down for a minute and really develop a great reason that you’re offering this special or bundle or launch or sale… you’re going to be more interesting and more successful with conversions. A holiday, like Thanksgiving or your birthday. We’ve seen examples of this all over the place in retail, right? But stretch yourself beyond the typical Labor Day/Black Friday/Veterans Day holidays and think of a reason that you can stand out from the crowd TODAY. Once upon a time when I was the Director of Marketing for GKIC, I created this amazing Holiday Promotions Product (that they still sell) filled with some of the coolest, most obscure, and highly effective holiday promotions. This weird holiday thing is kinda MY thing. And frankly, it should be your thing too. It’s just too easy to be successful with this! Is it your birthday? Great! Create an offer to give your customers a gift for YOUR birthday. Want to stand out even more? Send an offer on your half birthday and really get them talking. Do you know when National Chocolate Chip Cookie day is? How about Dog Appreciation Day? Did you know that either of those holidays existed? They do and there are more like them for every single day of the year. When you use something fun like holidays that are off the beaten path, you’re creating personality in your copy but you’re also creating an undeniable reason why for your offer. Sometimes you’re offering a special introductory offer – a special introductory price or a launch offer that your customers can only get when you’ve introduced a new product or service. This is a built-in reason why, but be warned: launch after launch after launch isn’t really a sustainable business strategy. Doing it this way, with the exception of how Marie does it, requires you to consistently come up with product after product, and you’re not encouraging those products to work for you after they’ve launched. GKIC’s product library, at the time I left, had something like 55 products in it. And yeah, we created some fanfare around a launch… but what’s more is we consistently promoted the older products to our member base to make sure those products consistently made us money. If we want to create an evergreen offer, we’ve got to make the copy work year-round. So a launch or a holiday isn’t really going to work in this case. The offer is really more intangible, but we can’t really say “I’m making this offer to you because psychologically you’re more inclined to respond this way.” That’s not going to work. See how I worded that? But obviously it takes more than a believable “reason why” to compel response. You’ll need to show them what’s in it for them and why they should respond right now. The second thing that a good offer will have is special pricing or package options. After all, it’s not really a special offer if it’s the same ol’ thing they can get any other day of the week, right? Now, there are two schools of thought on lowering your prices: the “Go for it!” school and the “Don’t you dare!” school. I like to play devil’s advocate, so I can find reasons for both. But lowering your prices isn’t the only way to create a special offer. And since lowering your prices is pretty self-explanatory, we’re going to cover the other ones. You’ll see examples of special payment options around Christmas time with Layaway Plans at places like Walmart and Kmart. They take advantage of the fact that many of their customers want to get big-ticket items like TVs or video game systems but don’t have the cash in hand to pay it all at once. You can do the same thing – you can offer a 2 or 3 pay option if you don’t already offer that option for your product. You can see here that the Magic Bullet is offering multiple payment options – which increases their response because the entire investment isn’t due up front! This lowers the initial investment that people are making in your product or service, and it can also lower the objection point as well. Which can result in more sales (in some cases, MANY more sales) for you. A good thing! You’re also now in charge of financing your customers’ purchase, which means you could potentially get screwed if you don’t have a great way to collect on those debts. This may not be a great option for you if your product or service is super intense or expensive to deliver, or if your customers are historically unable to pay on a payment plan. Generally speaking, the longer the payment plan, the higher your risk. Which makes sense when you consider that the more payments there are, the more chances your customers have to default. But also generally speaking, the longer the payment plan, the higher your response! Plus, the nice thing about payment plans is that you can charge for the convenience of financing. What do I mean? Well, if I have a $97 product and I’m offering the option to pay in 2 installments, I’m not going to simply divide $97 in half… I’m going to add a little on top. So I may say that the payments are 2 payments of $59. So it adds a little bit more in my pocket. You’ve heard it – “Act now and get another widget FREE!” Well… that’s bundling in a bonus! What can you bundle that will increase the value of your offer? The other way to offer something special withOUT lowering your prices is to add in a bunch of bonuses or create a bundle offer. You see this a lot in infomercials when they offer you a second widget for free… if you respond within a limited time! The first thing to avoid when you’re bundling is to avoid using cheap bonuses to try and build the value of an expensive product. For instance, don’t bonus a $27 ebook with a $1,497 course. The result is that you will end up devaluing the entire package in your prospects’ eyes. The second hurdle to avoid is to toss in a bonus for the sake of tossing in a bonus. You want to ensure that the bonuses fully make sense with your offer. When you have a product and bonuses work together, you then create a full package that becomes irresistible for anyone who’s got the problem you’re targeting. Will my prospects require the information/widget in order to be ready for my core product? Will my prospects find the information/widget useful after they’ve consumed my core product? This is known as the bonus sandwich – you’re sandwiching your product in between bonuses so your customers get the whole shebang. And after all of that, you simply MUST present a reason to respond right now. If you look closely, this website is using scarcity with a “Limited Edition” counter above the order button – which means they’re using BOTH scarcity and deadline in their marketing! Let’s face it – we as humans are either super busy all the time, major procrastinators… or we’re both. Your customers are no different – if they’re planning to get to it “later,” they’re never going to get to it. Your sale is going to get pushed to the bottom of their pile and by the time they get to it… their zeal and excitement is probably gone. There are two ways to get them to respond right now: Scarcity & Deadline. Let’s look at each one individually. This is a limit that you put on the number of spots or programs or products or whatever you have available. Again, Black Friday comes to mind simply because it’s that time of year. The big box stores will show you a TV that’s just $100 – a steal! – but there are only 5 of them at each store. So if you want that TV, you’d better be one of the first 5 people in line. Here’s the thing: BE HONEST about your limits. If you’re selling an ebook and say that you’ve only got 10 left, you’re not fooling anyone. Because it’s an electronic resource so you clearly have more than 10 left. Your deadline gets your audience to race the clock… which will make them respond faster than if there was no deadline at all! Like scarcity, your deadline encourages fast response… but instead of competing with other people for a limited number of spots, they’re racing the clock. So what are some good deadline tips or best practices? 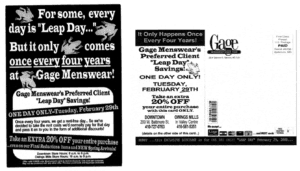 If you’re using direct mail, DO make your deadline approximately two weeks from the date your sales piece hits inboxes. Any shorter and you run the risk of not giving people enough time to respond. When choosing your deadline, DON’T go over a month or year – for instance, if it’s February 15th, don’t make your deadline March 2nd. This makes it feel like it’s “soooo far away” and you’re likely to get put at the bottom of the to-do pile. DO make your deadline set in stone – the last thing you want to do is train your audience that they can respond after a deadline and still get your special offer. That removes any actual drive to act now! DO show your deadline as often as possible. Landing page counters help this tremendously. So now that you know the anatomy of a great offer, take a look at the offers you’ve got out there. Do they cut the mustard? Are there 3 parts? Do those parts work in concert to compel your target audience to buy? If you’re not seeing the conversion you want, considering tweaking one of the three parts listed here. Sometimes, the smallest changes to your offer (like a shorter deadline or a more believable reason why) will do wonders for increasing response.